'Modeste' and 'Nothing Says' by Jim Cleary. 'Yes It Is' by John Lennon & Paul McCartney. Bob Wilson, Tony Kelsey, Alan Smith, Richard Tandy, Martin Smith, Mandy, George Styles, Nadine Stavonina, Lisa Kelsey, Pip Allkins, Steve Wilson, J.J.Forde. Cover design by Mandy Scott-Morgan. Mastered at His Place, Malvern. 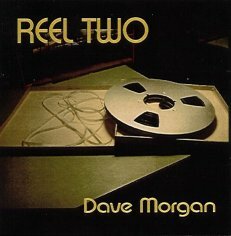 'REEL TWO' costs: £13 Incl. P & P. £14 Air Mail Ex-Europe and can be ordered via Dave & Mandy's website at www.scottmorgan.co.uk - cash, cheques and credit cards are welcome - secure credit card facilities are available at the website. "Earth Rise" - Richard Tandy & Dave Morgan ... a concept album recorded in the mid-80's. "The B.C. Collection" - Tandy-Morgan-Smith ... 17 rock/pop songs released in 1992. "Call" - David Scott-Morgan ... compilation of 16 Christian songs, 1997. "Long Way Home" - David Scott-Morgan ... 12 new Christian titles, 1999/2000. More details on the above albums and ordering information can be found at www.scottmorgan.co.uk. Dave Morgan has been around the Birmingham rock scene since the 1960's. Dave's involvement with Birmingham supergroups THE MOVE as a songwriter and the ELECTRIC LIGHT ORCHESTRA, as a band member from 1981-86 are legendary and well documented elsewhere, but his own music is less well known by a wider audience. Alan Heath - "Are there any plans to release any of your songs not previously released?" Mandy - "There's about sixteen stacks which we eat our dinner off! Piles of tapes!" Dave - "Cardboard boxes that we sit on! I have a few songs that we want to release, they are love songs." These previously unfinished old demos along with some newly recorded songs now see a release as 'REEL TWO' an album comprising mostly of love songs. Everyone of us are affected by Love on a day to day basis. The songs on this album have successfully captured all aspects of this universal theme. Whether young or old we all experience the ups and downs and highs and lows of loves full range of emotions, joy, hurt, togetherness, loneliness, bitterness and sweetness and much much more besides. The opening track 'GOLDEN OLDIES' springs the album into life and from there you embark on a roller-coaster of emotions. With tracks as strong as 'APRIL FLOWERS', 'WHAT LOVE ISN'T', 'EVER SINCE I CAN REMEMBER', 'THE BIT IN THE MIDDLE', 'NOTHING SAYS', 'PERFECT LOVE', and 'PLEASE DON'T GO' (which is a real tear jerker), they will be played over and over again and are going to be remembered as beautifully crafted classics. The quality of the songs are timeless, the production exceptional and Dave's voice has simply never sounded better than on this wonderful collection of songs. 'MODESTE' (a Jim Cleary song) deserves comparison with ELO's "HELLO MY OLD FRIEND" and the album also has it's humourous moments with 'GO GETTER LADY' and 'DO YOU MIND?' a song so full of tongue in cheek moments, watch out for the sting at the end of the song! 'YES IT IS', is a great cover of this sixties BEATLES b-side, and is arguably no less beautiful than the original. Recorded in an unplugged style the whole track send's shivers down your spine. All songs are performed by Dave Morgan with contributing musicians including former ELO stars Richard Tandy and Martin Smith along with Bob Wilson, Tony Kelsey, Alan Smith, Mandy Scott-Morgan, Nadine Stavonina, Lisa Kelsey, Pip Allkins, Steve Wilson, J.J.Ford and George Styles who provided the wonderful humourous trackette at the end. The songs on this album all add up to one thing, pure enjoyment. This collection of songs are simply the best collection of ELO-related songs to be released in a long, long time. Enjoy them to the full.